In March, in the face of strong public opposition the International Monetary Fund (IMF) published a working paper offering governments suggestions on how to move toward a cashless society. Now the global payments technology company Visa has started what it is calling “The Visa Cashless Challenge”. Visa is trying to “encourage” businesses to go cashless, and one of the ways that they will be doing this is by “awarding up to $500,000 to 50 eligible small business food service owners who commit to joining the 100% cashless quest”. In March, in the face of strong public opposition the International Monetary Fund (IMF) published a working paper offering governments suggestions on how to move toward a cashless society. In its report The Macroeconomics of De-Cashing, the IMF proposed to abolish cash and recommended to adopt measures in order to restrict its use. Now the global payments technology company Visa has started what it is calling “The Visa Cashless Challenge”. Visa is trying to “encourage” businesses to go cashless, and one of the ways that they will be doing this is by “awarding up to $500,000 to 50 eligible US-based small business food service owners who commit to joining the 100% cashless quest”. The food industry is still one of the last bastions where cash is used very heavily, and so it makes sense that Visa would want to target that segment. Of course the more people that use cards to pay for meals, the more money that Visa will make. Have you ever had an experience where going cashless helped you? Or a day when you completely went cashless? Share your best stories of going cashless with us using the form below and lucky winners will stand a chance to win Rs. 1000 gift vouchers. The more stories you share, the higher your chances of winning! Just a cursory look at some of the stories would tell you the truth behind them. Companies like Visa, NDTV, MasterCard and others would love to eliminate the use of cash entirely because it would mean much bigger profits for them. And of course cashless systems hold a lot of appeal for governments as well because such systems would allow them to monitor and track the behavior of their citizens much more closely, but so would the MNCs also who are contracted to provide this technology. Has the Indian government really gone after the money launderers? Was there any investigation done with the data already available and provided in the Panama Papers or the SwissLeaks or the data provided by HSBC whistleblower Hervé Falciani and others? We were told Demonetization would hit hard terrorists funding sources and eliminate terrorism from India. Has the terrorist incidents decreased or increased since then? And all the while on top of that doing totally contrary to its objectives and putting the security of the entire country at risk, the govt gave currency printing contracts to foreign companies that were involved in terrorist attacks in India. The GoI and even these companies know that people in India still prefer cash to digital which for them is a barrier to their stated goal of a Cashless Society. After the banking collapse of 2008 as a measure to combat the growing liquidity crisis there began a global push by Governments, Central Banks and Multinational Companies to eliminate the use of physical cash around the world and replace it with digital money. This movement is often referred to as “The War on Cash”. Once every year these elite bankers, leaders in business and government meet at the World Economic Forum meeting held in Davos, Switzerland where they chart out the future course of the global economy. Immediately after the conference in January last year, there was a big acceleration to eliminate paper cash, or at least high-denomination currency notes worldwide. Experts have alluded to this secret meeting for kick-starting the Global War on Cash. 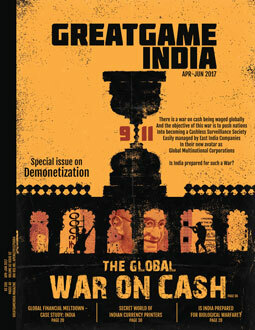 There is a war on cash being waged globally and the objective of this war is to push nations into becoming a Cashless Surveillance Society easily managed by East India Companies in their new avatar as global Multinational Corporations.